You are currently browsing the Grand Review, 2010 category. 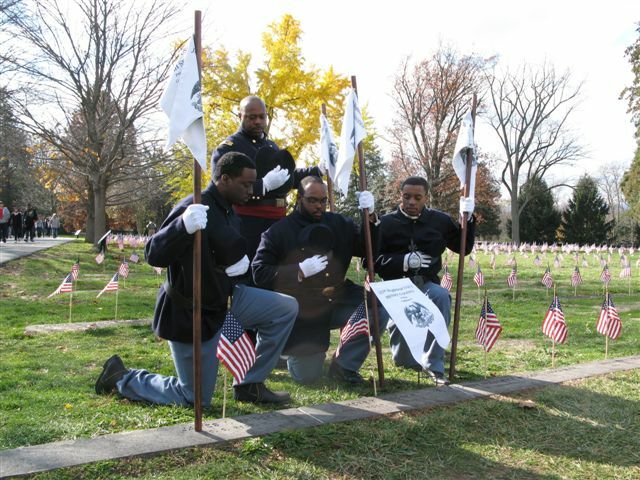 On November 5-7, 2010, the city of Harrisburg will witness another Grand Review in honor of the African American patriots of the Civil War. Several activities have been planned for this major commemoration. This section offers a forum for sharing the latest plans and news about the 2010 efforts. Posted Friday, February 26th, 2010 at 7:58 pm. Posted Sunday, January 9th, 2011 at 11:08 pm. 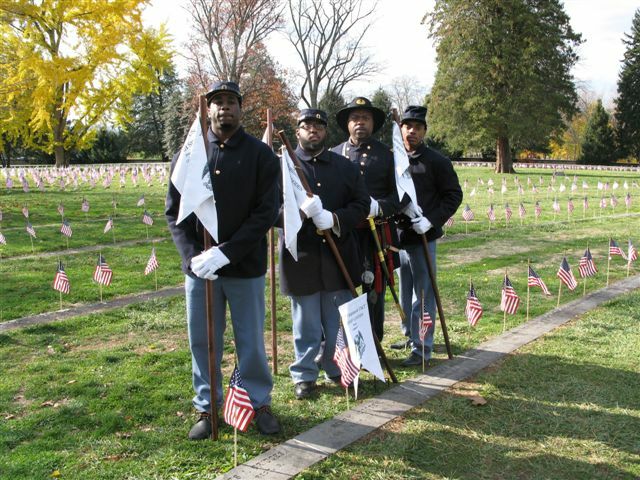 On November 14, 2010 a ceremony in Columbia, Pennsylvania honored those men who served in the United States Colored Troops during the Civil War. 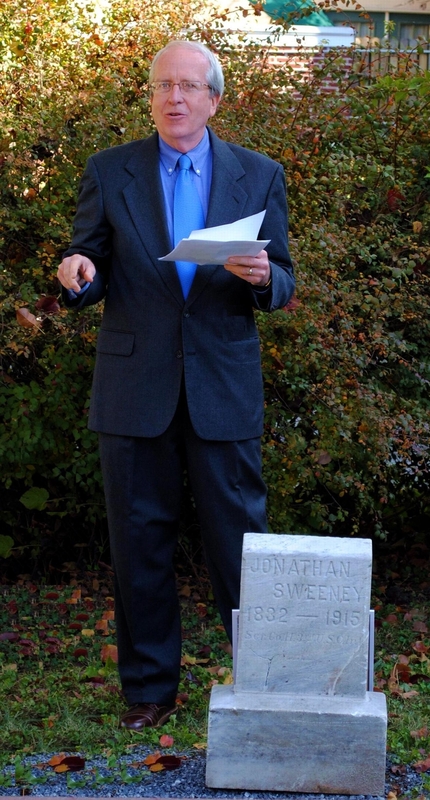 See photographs from this event in the slideshow below. Posted Sunday, January 9th, 2011 at 10:08 pm. 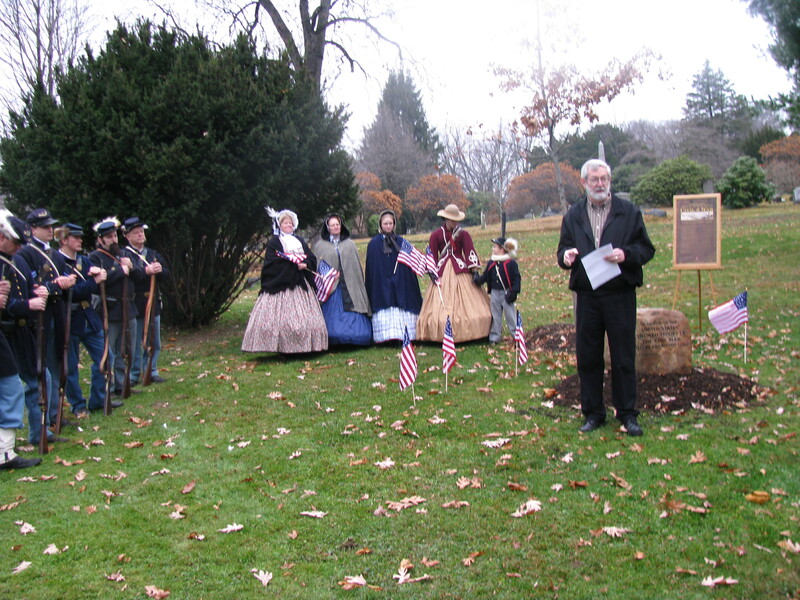 On November 14, 2010 Crawford County held a ceremony at Greendale Cemetery to honor those men who served in the United States Colored Troops during the Civil War. 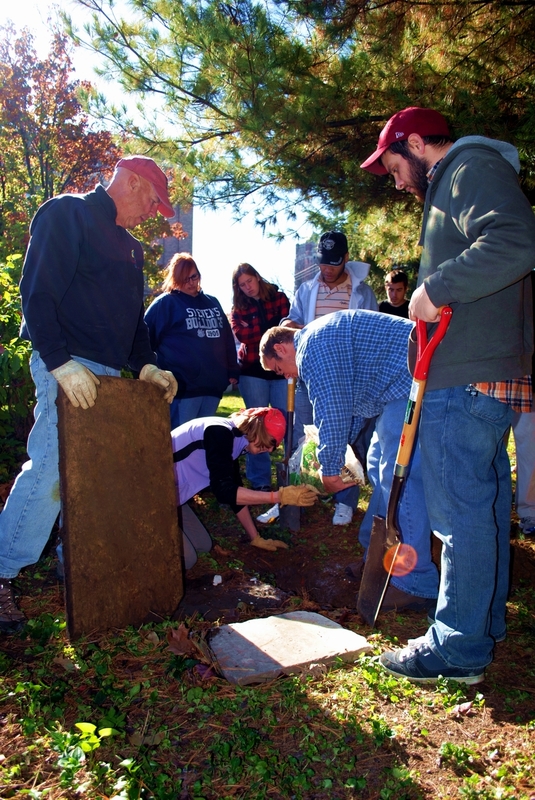 Read more about this event in this article from the Meadville Tribune. Posted Sunday, January 9th, 2011 at 9:38 pm. Posted Sunday, January 9th, 2011 at 8:47 pm. A number of media groups filed reports on the Pennsylvania Grand Review that took place in Harrisburg last week between November 4 – 7. 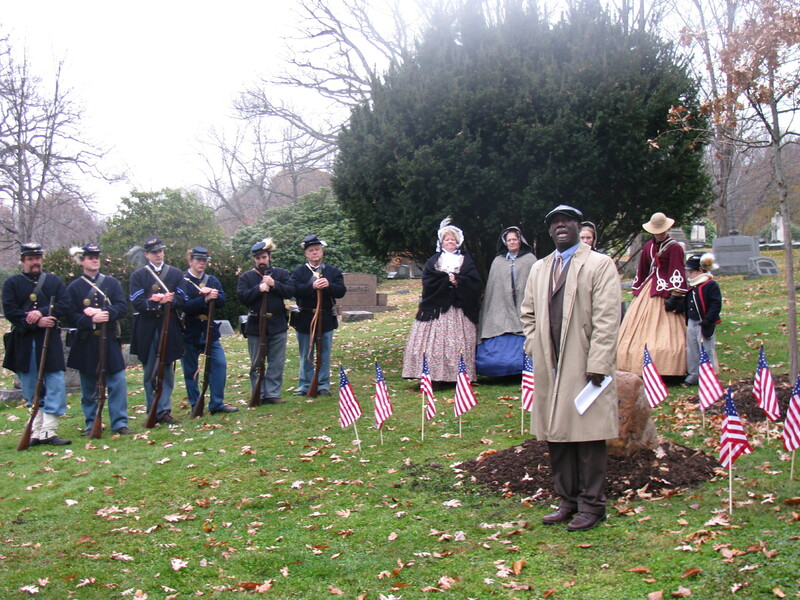 “Saturday’s colorful parade touched everyone who saw it,” as Charles Thompson of the Patriot-News explains. 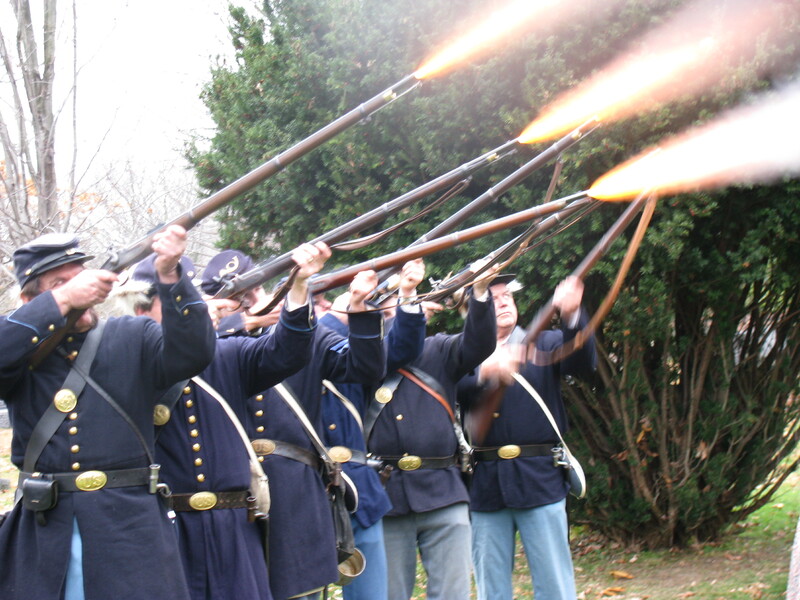 The parade on November 6 included over 100 reenactors, which as Thompson notes, makes the Grand Review “one of the largest gatherings of U.S. 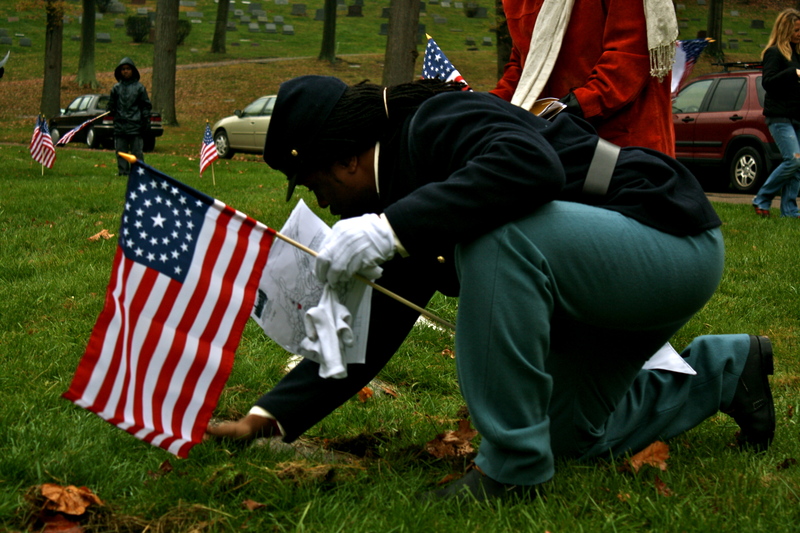 Colored Troops reenactors anywhere.” “Recalling these soldiers now — at the onset of what surely will be five years of reflection on the 150th anniversary of the Civil War — underscores the value of their special role in fighting that war and the historic role played by Harrisburg,” as the Patriot-News Editorial Board observes. Pennsylvania Governor Ed Rendell also attended the event. 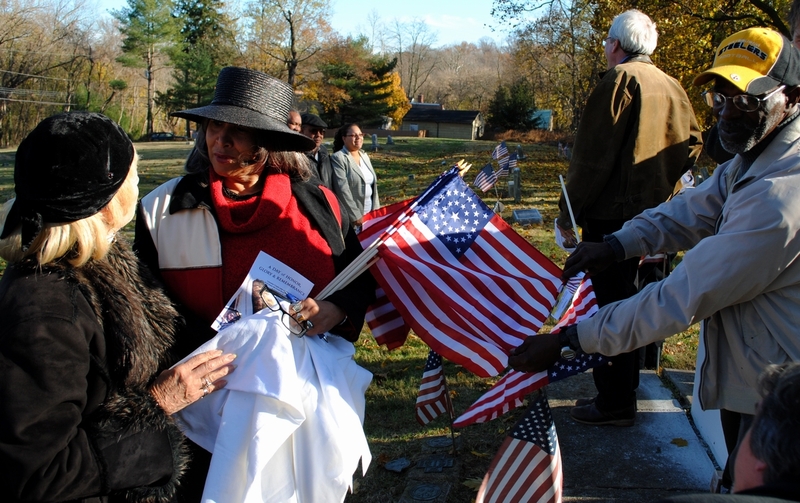 “Eden also serves as the final resting place for the most black Civil War veterans in Pennsylvania — possibly the most Civil War veterans of any color or creed in the state. 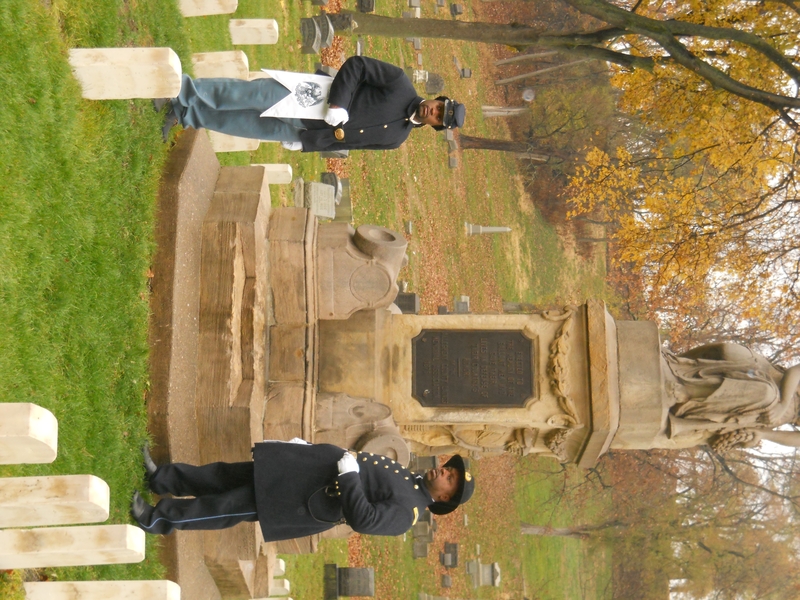 On Sunday members of the 3rd Regiment U.S. 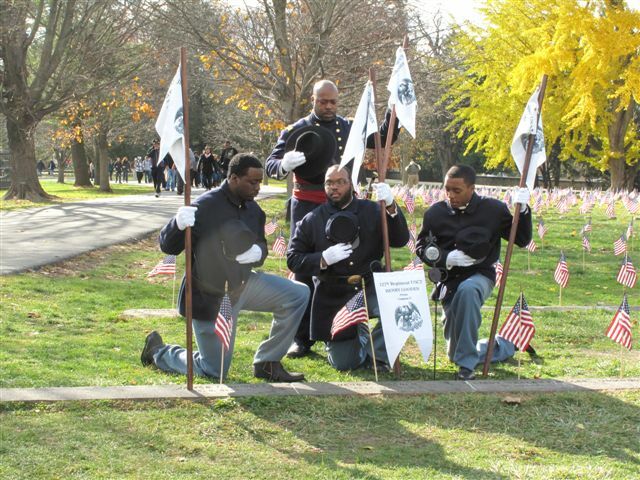 Colored Troops Civil War re-enactors honored them with a rifle salute and wreath-laying as part of a 150th anniversary observance of the Civil War.” Click here to full editorial Also see this article about the event. Posted Monday, November 8th, 2010 at 3:30 pm. 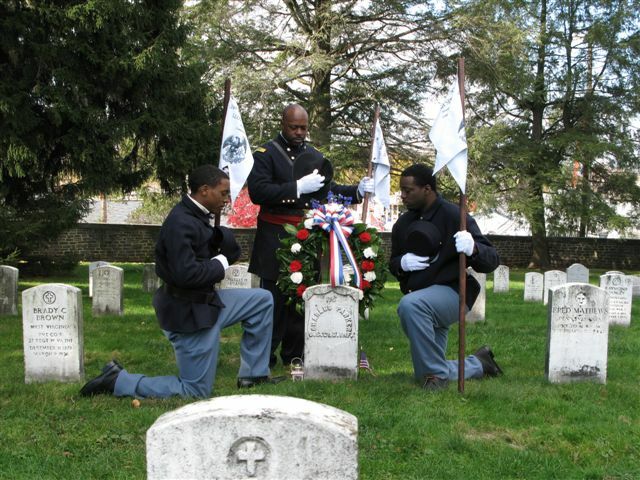 A recent article published in the York Daily Record featured a veteran who served in Company B of the 32nd United States Colored Troops. 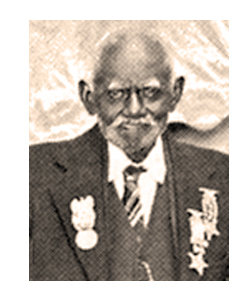 John Aquilla Wilson grew up in York County, Pennsylvania and enlisted in February 8, 1864. 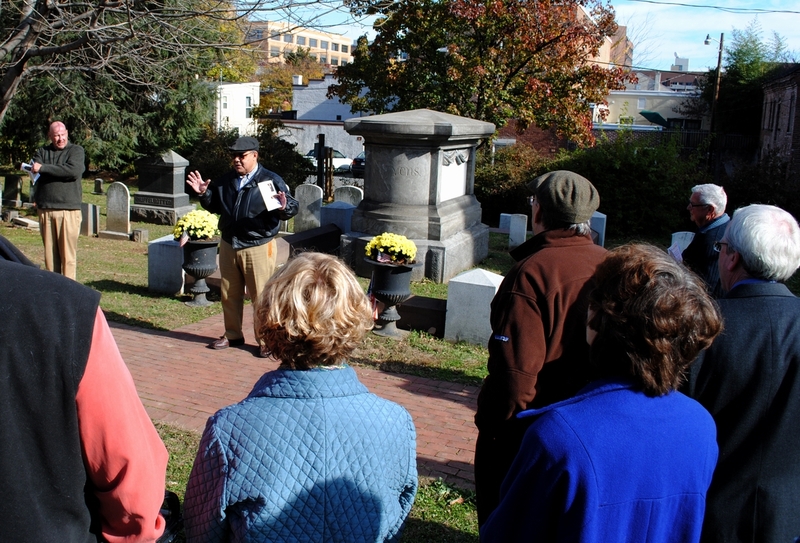 After the Civil War, Wilson’s granddaughter “recalled that they used to go to Gettysburg every year so he could participate in a parade that honored Civil War veterans.” According to reporter Teresa Ann Boeckel, Wilson “lived to be 101 years old [and was] one of the last surviving Civil War veterans in York County.” The full article is available here. You can read more about Wilson on the York Town Square blog and in Wilson’s profile on House Divided. Posted Friday, October 22nd, 2010 at 1:28 pm. HSP collects both personal papers created by individuals and families, and records created by organizations and businesses. Types of materials that we collect may include: letters, diaries, account books, deeds, meeting minutes, scrapbooks, photographs, drawings, pamphlets, invitations, articles of incorporation, professional files, financial and membership records, legal documents, and others. For more information, see our official Collections Scope document and the more detailed Archives Department Collecting Guidelines. To transfer ownership of the archival materials to HSP, we will ask you to sign a deed of gift. The deed of gift includes a brief description of the material donated and can be customized to address the individual donor’s needs. 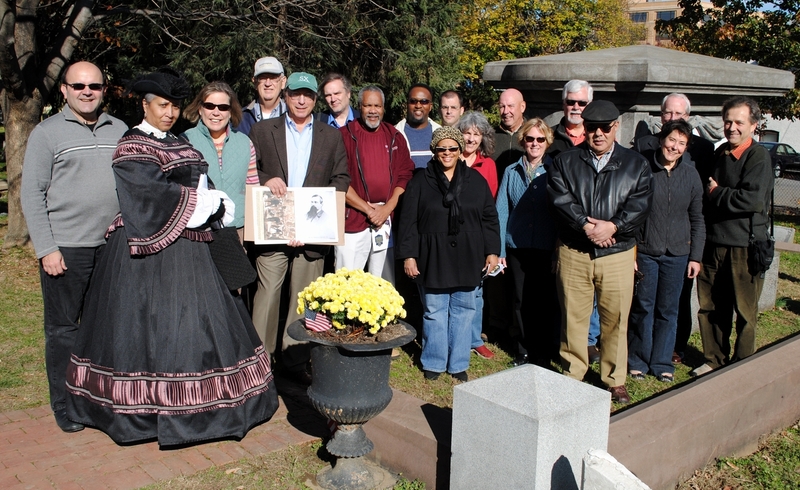 The donation becomes official once it is reviewed and approved by the Library Committee of HSP’s Board of Councilors. HSP generally does not accept materials on deposit or on loan. Posted Wednesday, October 6th, 2010 at 4:01 pm. 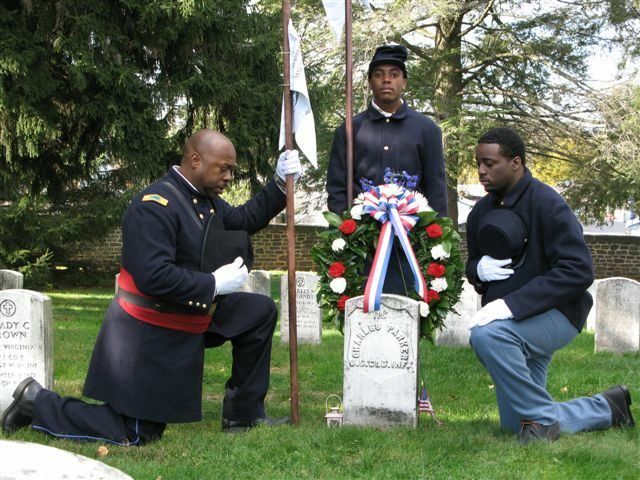 Those of you familiar with Pennsylvania Grand Review and its partner sites have probably seen this “stock image” representing a young soldier of the United States Colored Troops. 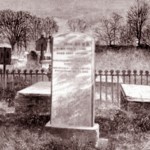 Similarly, there is also another image shown below that stands as a place mark for images of cemeteries designated as “Hallowed Grounds.” We use these images simply because we have not yet have images for these soldiers and/or their resting places. If you happen to have images of any of these men, perhaps in your family collection, or can provide photographs of their gravestone and/or a general photographic view of the cemeteries in which they are buried, you can become a valuable contributor to the project. 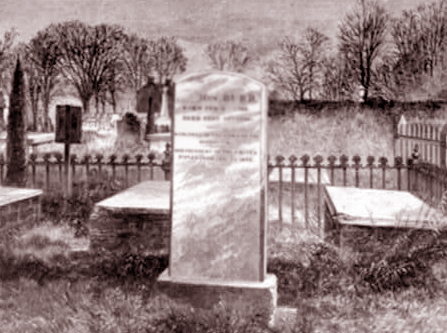 Family photographs can be scanned or shot with a digital camera while cemetery digital photographs can be sent as you took them. Send the resulting files along to us by e-mail at housedivided@dickinson.edu. Please keep the digital images at a decent size, no smaller than 650 x 750 pixels if you can manage it. Do not cut them down or edit them; we will do that for you. And you will receive credit in all postings as photographer and contributor. If you are more technically equipped, you can help us in one final way by providing the GPS co-ordinates for individual grave markers or cemetery gates. This will help us give the most accurate directions for visitors to the “Hallowed Grounds” where these American heroes rest. Should you have any difficulty or simply wish to ask advice on a contribution, please do not hesitate to contact us through this blog or by electronic mail. P.S. 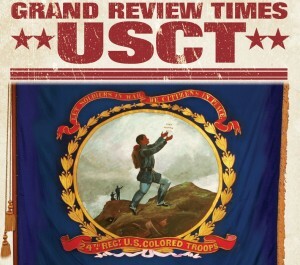 For those who may be interested, the representative image we use for the U.S.C.T. 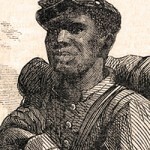 soldier is taken from a Harper’s Weekly drawing of “The Escaped Slave in the Union Army” in July 1864 while the cemetery icon is adapted from an artist’s representation of Aaron Burr’s grave in Arlington Cemetery, also published in Harper’s but in March 1869. Posted Tuesday, July 20th, 2010 at 1:58 pm. 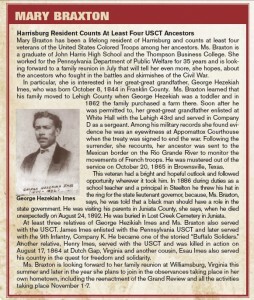 Mary Braxton has been a lifelong resident of Harrisburg and counts at least four veterans of the United States Colored Troops among her ancestors. Ms. Braxton is a graduate of John Harris High School and the Thompson Business College. 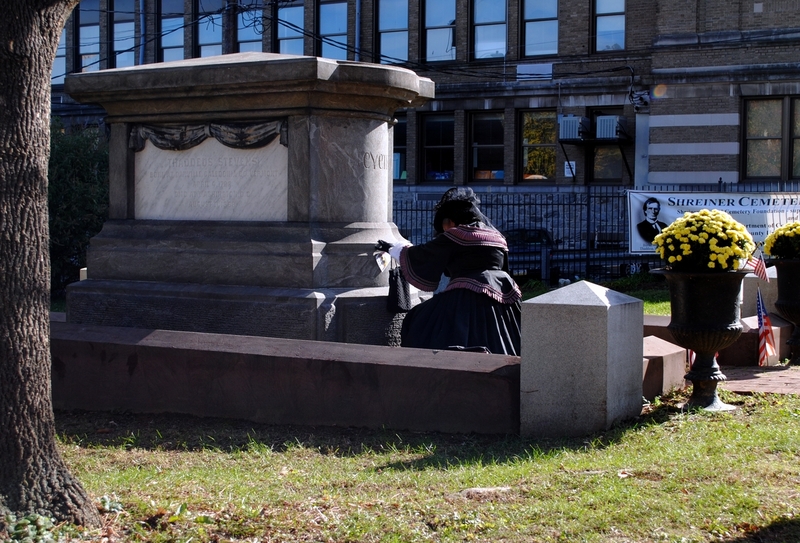 She worked for the Pennsylvania Department of Public Welfare for 35 years and is looking forward to a family reunion in July that will tell her even more, she hopes, about the ancestors who fought in the battles and skirmishes of the Civil War. 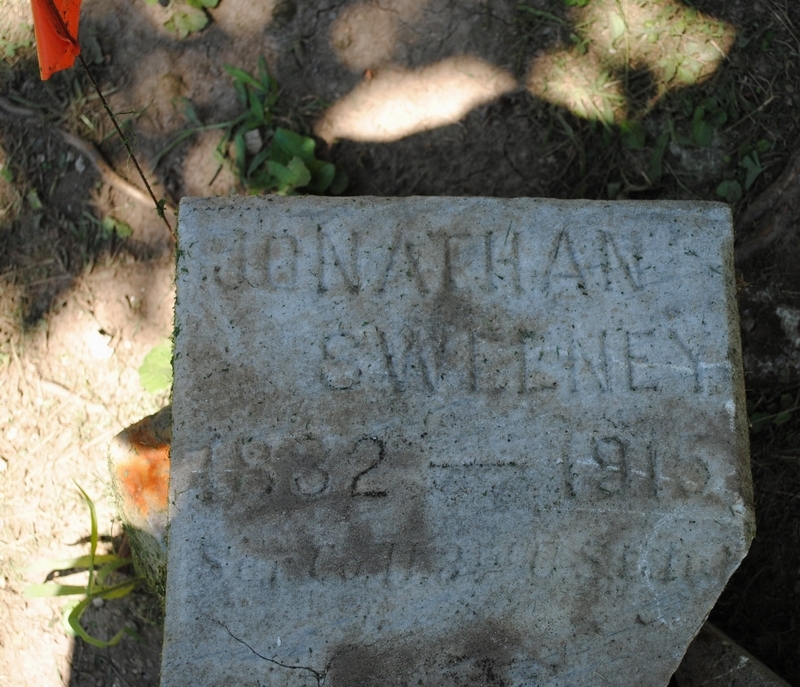 In particular, she is interested in her great-great grandfather, George Hezekiah Imes, who was born October 8, 1844 in Franklin County. 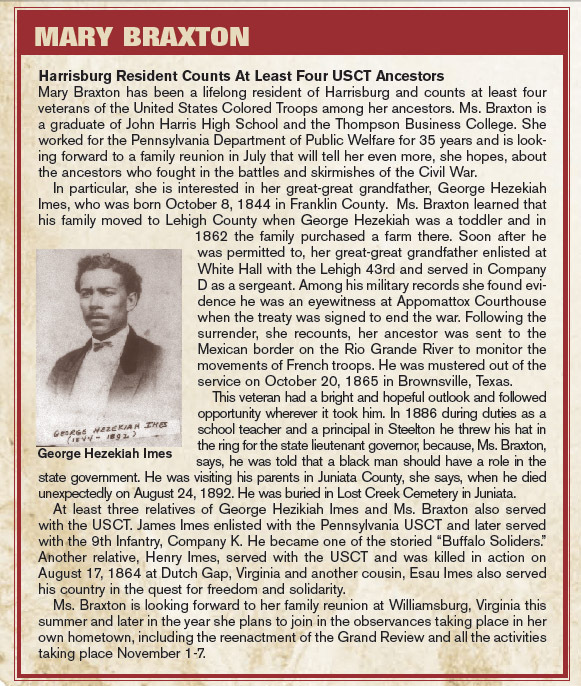 Ms. Braxton learned that his family moved to Lehigh County when George Hezekiah was a toddler and in 1862 the family purchased a farm there. Soon after he was permitted to, her great-great grandfather enlisted at White Hall with the Lehigh 43rd and served in Company D as a sergeant. 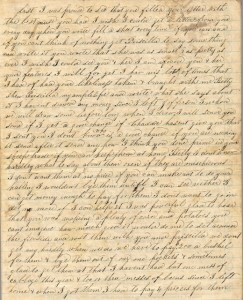 Among his military records she found evidence he was an eyewitness at Appomattox Courthouse when the treaty was signed to end the war. Following the surrender, she recounts, her ancestor was sent to the Mexican border on the Rio Grande River to monitor the movements of French troops. 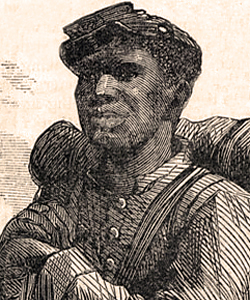 He was mustered out of the service on October 20, 1865 in Brownsville, Texas. Posted Thursday, June 10th, 2010 at 1:11 am.